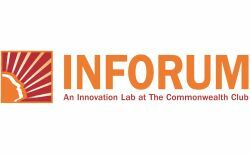 Presented by Inforum: An Innovation Lab at the Commonwealth Club. We host live events in San Francisco to connect the Bay Area’s most interesting people with inspiring thought leaders from tech, pop culture, politics, food, and business. Our panels and interviews go beyond the sound bite and offer deeper engagement with the world today.